Myshak Crane & Rigging utilized its entire fleet of Hydra-Slide hydraulic skidding equipment in addition to various other heavy rigging tools to changeout a horizontal converter at a fertilizer production plant in Alberta, Canada recently. The old and new converters weighed 514 tonnes and 520 tonnes respectively. The facility produces and distributes over 26 million tonnes of potash, nitrogen, and phosphate products for agricultural, industrial, and feed customers worldwide. Eventually, it was decided to replace it with a bigger unit, which would require Myshak to explore the breadth of its rigging equipment fleet that includes a 300-ton capacity heavy track HT300 and 350-ton capacity low profile LP350 hydraulic skidding systems, complete with over 60m of combined track. Hydra-Slide JLS250 jacking load shoes and a Hydra-Pac synchronous 10,000-psi hydraulic unit to power six double-acting hydraulic cylinders were also required. 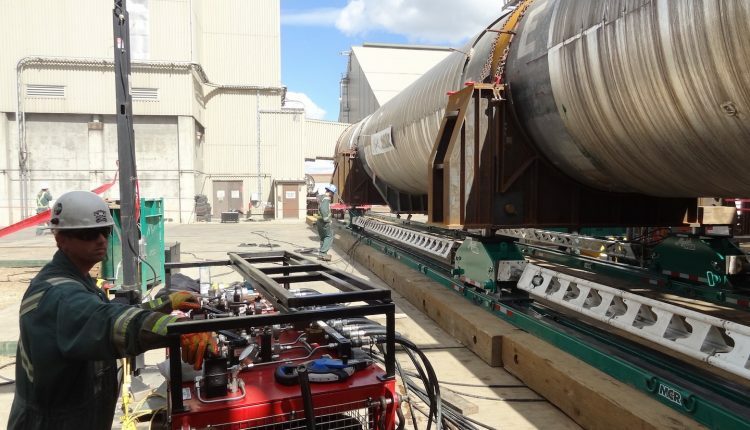 Burton explained that Myshak first received the new converter and accompanying basket from rail and offloaded them using the HT300 skid system for storage until the shutdown was underway. It was then required to load out and transport an old, spare basket from site to make room for the installation of the new, larger one. Then Myshak loaded and transported the new converter basket from storage to the plant to be filled with catalyst prior to installation once the shells were switched out. The old converter shell complete with basket and catalyst weighed 514,500kg and was 2.7m in diameter and 32m long. It was jacked up and skidded horizontally in one piece more than 50m to a more open area using the JLS250 skid shoes and HT300 skid track where it was then loaded onto a self-propelled modular transporter (SPMT). The new converter shell weighed 377,000kg without the basket and 520,200kg with it, and measured 3.0m in diameter and 35m in length. It was then skidded the same distance into position over the foundations and lowered onto the anchor bolts. The six JLS250 jacking load shoes were hydraulically connected in a three-point suspension to lift and slide the converters on the HT300 track. The shoes are a universal design that work with both Hydra-Slide’s heavy track HT300 or HT500 skidding systems. They can be connected hydraulically with any number of other shoes increasing the total system capacity while maintaining equal load support and weight distribution. The JLS250s and HT300 did the bulk of the work but the low profile LP350 system was used to remove the head on the converter due to clearance issues. At the end of September, Myshak will use the JLS250 shoes and HT300 to pull and remove the basket from the old shell for disposal. Hydra-Slide recently redesigned the HT300 shoes and cylinders to be capable of either pushing or pulling the load to further increase their capabilities. Both Hydra-Slide and Myshak agreed that the project was a prime example of a rigging crew and all parties involved working together to pull in the same direction. Teamwork and collaboration on this high profile project made a successful outcome possible.